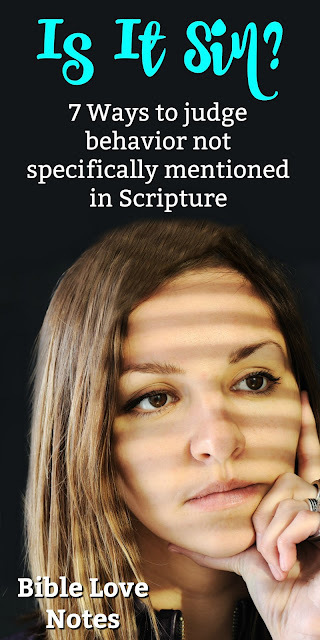 This Bible study is based on the 1-minute devotion, Is it a Sin? If something is condemned in Scripture, it’s wrong. 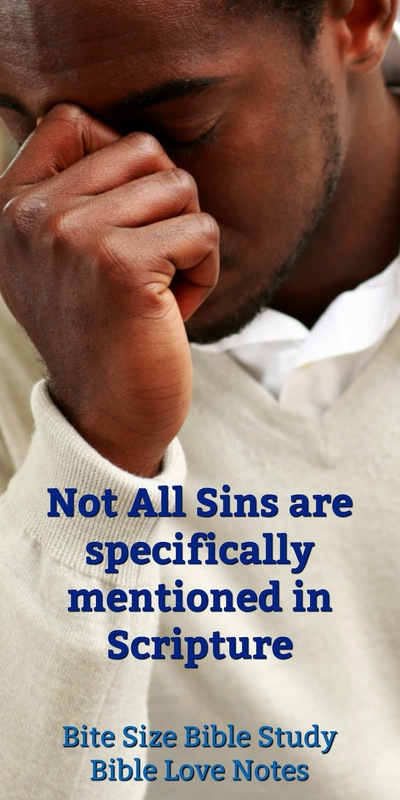 But how do we judge behavior not specifically mentioned in God's Word? If we're open and honest with ourselves, God's Spirit will convict us of sin (John 16:8; John 16:13), but our environment, culture, and experiences can affect our discernment. 1. Does it violate a scriptural principle? Scripture doesn't specifically mention every form of murder (e.g. abortion, suicide, poisoning, etc.). Scripture doesn't address every addiction (recreational marijuana, smoking, caffeine, etc.). Scripture doesn't mention every possible sexual sin, every form of pride, every type of occult activity. But that doesn't mean these things are approved by God. 2. Does this activity involve lack of self-control? Galatians 5:22-23: "But the Holy Spirit produces this kind of fruit in our lives: love, joy, peace, patience, kindness, goodness, faithfulness, gentleness, and self-control. There is no law against these things!" Taking lack of self-control a step further: Is the behavior addictive or controlling? See How a Christian Should View Addiction. 1 Corinthians 6:12: "'I have the right to do anything,' you say--but not everything is beneficial. 'I have the right to do anything'--but I will not be mastered by anything." 2 Peter 2:19: "people are slaves to whatever has mastered them." 1 Corinthians 3:16-17: "Don’t you know that you yourselves are God’s temple and that God’s Spirit dwells in your midst? If anyone destroys God’s temple, God will destroy that person; for God’s temple is sacred, and you together are that temple." 1 Corinthians 6:19-20: "Do you not know that your bodies are temples of the Holy Spirit, who is in you, whom you have received from God? You are not your own; you were bought at a price. Therefore honor God with your bodies." If we're harming others, the behavior is wrong. Period. Matthew 7:12: "So in everything, do to others what you would have them do to you, for this sums up the Law and the Prophets." Romans 13:10: Love does no harm to a neighbor. Therefore love is the fulfillment of the law. Romans 14:7: "For none of us lives for ourselves alone, and none of us dies for ourselves alone." Sometimes an activity in and of itself is not ungodly, but it's a waste of time. Does it keep us from fulfilling other responsibilities? Does it keep us from developing meaningful relationships with friends and family? Does it keep us from spending time in prayer and Bible study? 1 Corinthians 10:31: "So whether you eat or drink or whatever you do, do it all for the glory of God." 1 Corinthians 10:23: "'I have the right to do anything,' you say--but not everything is beneficial. 'I have the right to do anything'--but not everything is constructive." Because we live in a fallen world, we will be around ungodly people and ungodly influences, but we shouldn't choose activities that unnecessarily put us in these situations. Romans 12:1-2: "Therefore, I urge you, brothers and sisters, in view of God’s mercy, to offer your bodies as a living sacrifice, holy and pleasing to God—this is your true and proper worship. Do not conform to the pattern of this world, but be transformed by the renewing of your mind. Then you will be able to test and approve what God’s will is—his good, pleasing and perfect will." 1 Corinthians 15:33: "Do not be misled: 'Bad company corrupts good character.'" See 4 Types of People God Tells Us to Avoid. Christians should never disobey government laws unless those laws require that we break God's laws. For more on this: God Wins all Wrestling Matches. But it's also important to note that God does not approve of everything that is legal. If it's legal but violates any principle in Scripture, it's "illegal" for the Christian. 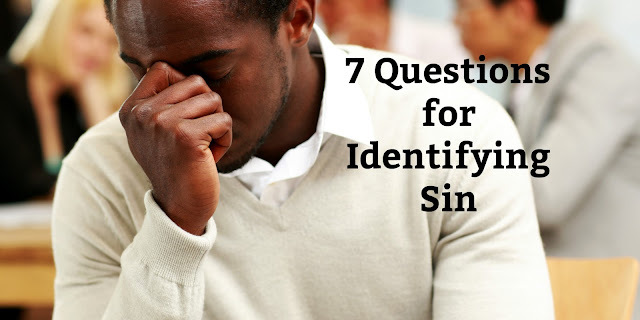 I encourage you to test things in your life using these 7 criteria. May God give us wisdom and grace -- and hearts that fully seek Him!